The global osteoporosis drugs market is analyzed in a report by Transparency Market Research (TMR). The market is expected to grow due to the increasing geriatric population across the globe. The market for osteoporosis drugs is considered semi-consolidated as a handful of players hold a larger share in the market. As per the analysis, Novartis International AG, Eli Lilly and Company, Merck & Co. Inc., Pfizer Inc., and Amgen Inc. held 63% of the total market share. The availability of effective products by these companies has enabled them to establish a stronghold in the market. Companies providing generic drugs that have the same active pharmaceuticals ingredient (API) are significantly contributing in the osteoporosis drugs market. The companies producing generic drugs are Teva Pharmaceutical Industries Ltd., Novo Nordisk A/S, F. Hoffmann La Roche Ltd., and Actavis plc. 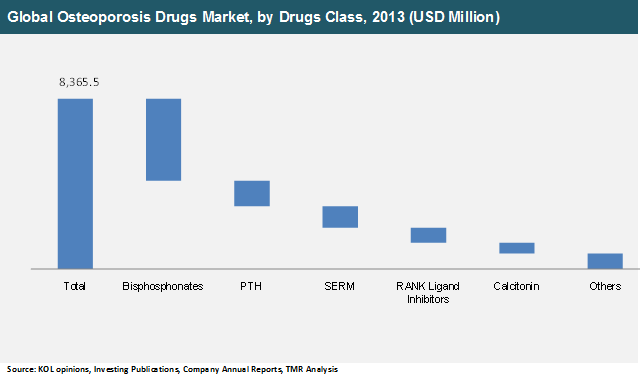 As per the analysis done by TMR, by drug class the bisphosphonates segment is the fastest growing segment in the osteoporosis drugs market during the forecast period. Geographically, North America is the leading the global osteoporosis drugs market, mainly due to increased number suffering from osteoporosis. Technological advancements and increasing awareness about the disease have also grown in this region. Increasing population in the Asia Pacific will also boost the demand for osteoporosis drugs market in the forecast period. Osteoporosis develops due to increasing pores in the bones. As the density in the bones increases. It makes the bones weaker and breakable. Thus, increasing the risk of fractures, mainly in wrist, hip, and spinal vertebrae. The development of bone tissues continues until late 30’s and then starts reducing rapidly. If it reduces rapidly, it results in osteoporosis. Osteoporosis is largely seen among females as compared to males, mainly after menopause that decreasing estrogen in the body. Major factors surging the demand for osteoporosis drugs is the huge population suffering from this disease. According to the International Osteoporosis Foundation (IOF), the number of women suffering from osteoporosis has crossed more than billion. As a result, globally the demand for osteoporosis drugs is increasing rapidly at an alarming rate. In addition, with the development of new drugs classes that are generic in nature and reduces the side effects, as well as it also overcomes the threat of chronic drugs will also grow the global market for osteoporosis drugs. A study conducted by National Institutes of Health Osteoporosis and Related Bone Diseases, discloses that the changing living patterns and increasing consumption of alcohol, smoking, and sedentary lifestyle will raise the risk of osteoporosis in males. Thus, creating urgency to curb this disease and eventually increasing the demand for osteoporosis drugs market. The availability of a huge variety of pipeline drugs waiting for their approval in clinical trials will also boost the osteoporosis market. Abaloparatide, Romosozumab, ZP-PTH, Blosozumab, and ZP-034 are drugs yet to make their presence and curb the osteoporosis in the market. Furthermore, constant research and development by health organizations and companies to improvise newer techniques and develop alternative treatments is expected to grow the market in future. Additionally, increasing investments through various organizations is predicted to boost the global osteoporosis drugs market.